White Bordeaux wine has experienced some of the same problems with aging that was discovered in the white wines from Burgundy, Premox, or premature oxidation. The effects a wine suffers from due to premature oxidation are such that after a moderate period of cellaring, the wine rapidly deepens in color and the wine develops a nutty, almost sherry like profile that renders the wine undrinkable. The problem with premox in white Bordeaux wine is not nearly as widespread as it is in Burgundy. In Burgundy, which is as famous for its red wines as it is for its white wines; millions and millions of bottles have been ruined due to premox, or premature oxidation. While 90% of Bordeaux is devoted to the production of red Bordeaux wine, white Bordeaux wine is significant, especially in the Pessac Leognan appellation, where the Sauvignon Blanc and Semillon grapes are planted. Millions of bottles of inexpensive white Bordeaux wines are made in Entre deux Mers every year which are intended for early drinking in its first year or two after the vintage. 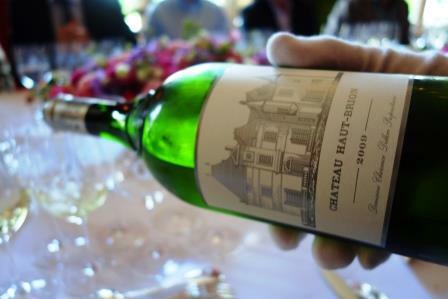 However, the best dry white Bordeaux wine is noted for its aging possibilities, most notably, Chateau Haut Brion, Chateau La Mission Haut Brion and Domaine de Chevalier. At their best, those wines can age and improve effortlessly for decades. Vintages with more than 50 years of age can still taste fresh and vibrant today. When the possibilities of premox began to be discussed, it’s easy to understand how it quickly, but far too quietly became an issue of importance. In the white Bordeaux wines from Pessac Leognan, the problems caused by premox were first talked about shortly after the turn of the century, in about 2003. 2003 was the hottest, driest year on record in Bordeaux. For many wines, in regards to their aging potential, 2003 has not turned out as well as some people thought. So I am not sure that that specific vintage should be used to measure the effects of premox in white Bordeaux wine. Faulty corks which did not provide a correct seal to allow the correct exchange between the levels of oxygen and the wine. Grapevines that are planted in soils where high levels of hydric-stress can occur coupled with a lack of sufficient nitrogen in the soil. This problem can be exacerbated by the drive for over production. The use of Pneumatic wine presses has been cited. White Bordeaux wine produced by using Pneumatic wine presses are said to lack sediment. Sediment protects wine as it uses up oxygen that would lead to premox issues in white Bordeaux wine. Related to this same cause is wines that have been aged on their lees for too long. Increasing the length of the fermentation process has had a negative effect with lighter styles of white Bordeaux wine. Decreases in the amount of sulfur during vinification is thought to be problematic as the amount of sulfur used should be consistent. An increase in the amount of sulfur as a protective measure before bottling is not adequate. Increased percentages of new, French oak barrels for the aging process is thought to allow too much oxygen into the wine during the aging period. This is because new oak barrels are more porous than older, used barrels which would allow more oxygen into the wine.